Fall 2006: Crescat lays out the macro case for the housing bust, financial crisis, and recession before it all unfolds. The housing market has played an enormous role in the US economic expansion over the last five years and we think it will play an enormous role in what will be likely a recession or a significant economic slowdown. We are convinced that the housing bubble-to-bust scenario is the most important macro- economic theme in the market today in terms of potential investment risk and returns. Therefore, we are basing much of this research letter on this theme. We think there is a major disconnect in the market with respect to the housing bubble. The popular idea of late is that the worst of the housing correction and its potential negative effect on the economy is behind us. When we look at the data, it becomes clear that this perception couldn’t be further from reality. We think the current market for housing in the US is akin to the market for tech stocks in the year 2000. We are the top of a bubble that has only just started to burst. Home prices have had an excessive and historically unprecedented rise in real terms over the past five years. We can see this by looking at the index of real American home prices in Chart 1 created by Robert J. Shiller, a professor of economics at Yale. Shiller’s index shows the changes in inflation-adjusted housing prices over time going back to the year 1890 where the index starts at the benchmark of 100. For over a century, the index ranged from the high 60stothelow120s. 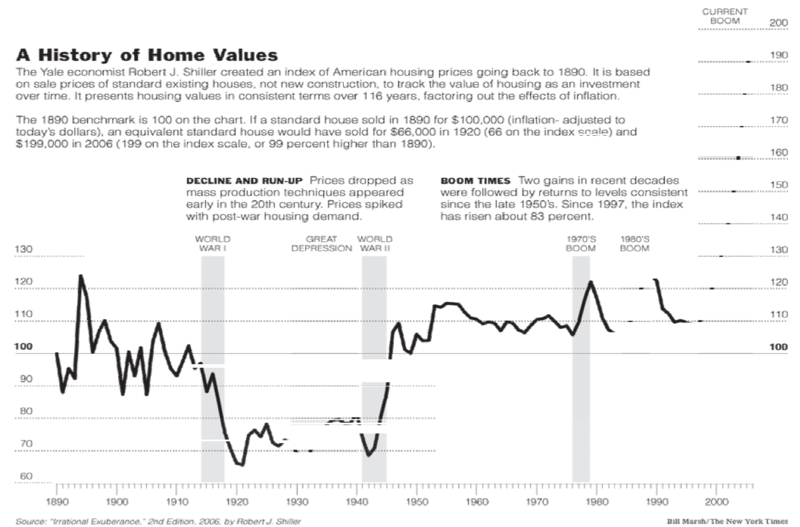 Homeprice “booms” in the 1970s and 1980s reached 120+% of the benchmark. In the new century, however, the index shot through the roof, to 200 as shown in the chart by the end of 2005. 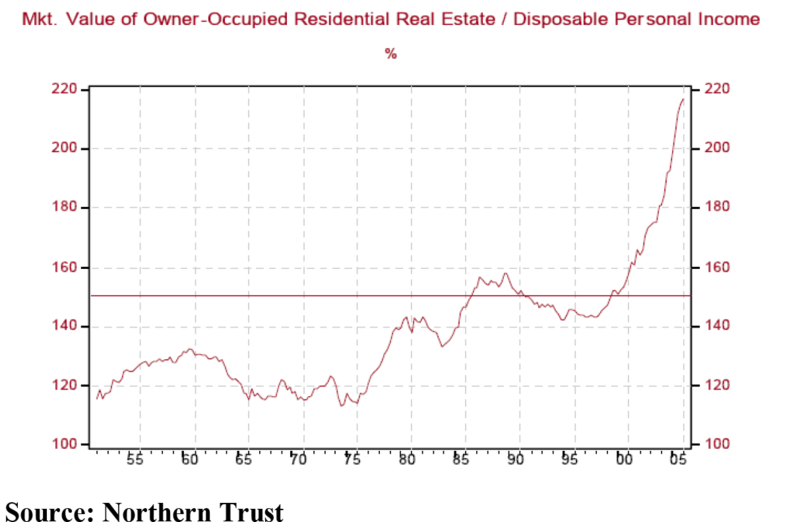 Chart 2 shows residential real estate values relative to disposable personal income which reveals a similar imbalance. These first two charts clearly show that in comparison to past “booms”, the current boom is a “bubble”. It is also important note that Shiller’s index dispels the popular notion that home prices historically have never gone down. Home prices registered their first decline of the century in August this year. We are now waiting for the September numbers to come out for existing homes but in new homes September showed a further drop. We expect the decline to continue. Clearly, home prices recently have reached all-time excess. But how do we know that home prices have further to decline? The answer is: supply and demand. When supply exceeds demand prices correct downward. 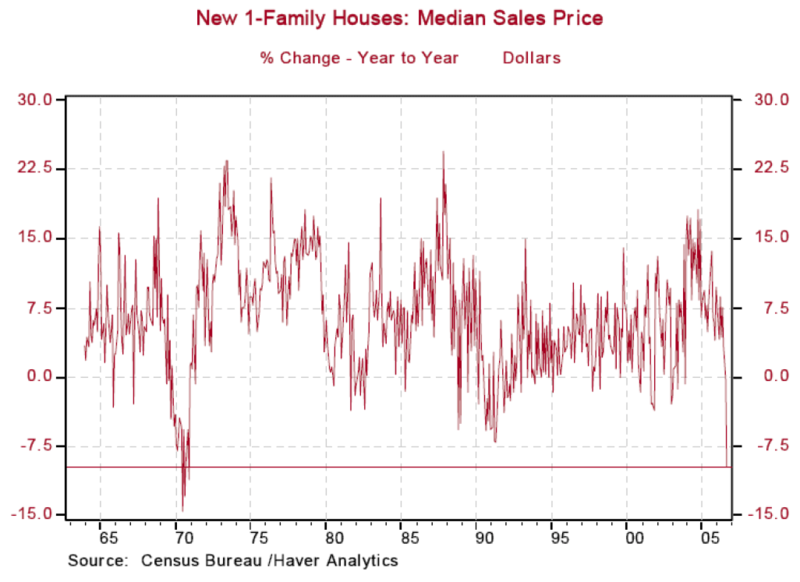 The supply/demand imbalance appears on track to become the worst in the history of US residential real estate. To understand the imbalance, look at the trend of existing homes for sale relative to homes sold in Chart 3. Homes for sale have been growing increasingly faster than homes sold all year. The recent reading of minus 50 on the chart in August means that homes for sale grew 50% more than homes sold. According to economist Asha Bangalore at Northern Trust, this is the worst supply/demand imbalance based on this measure since 1972. 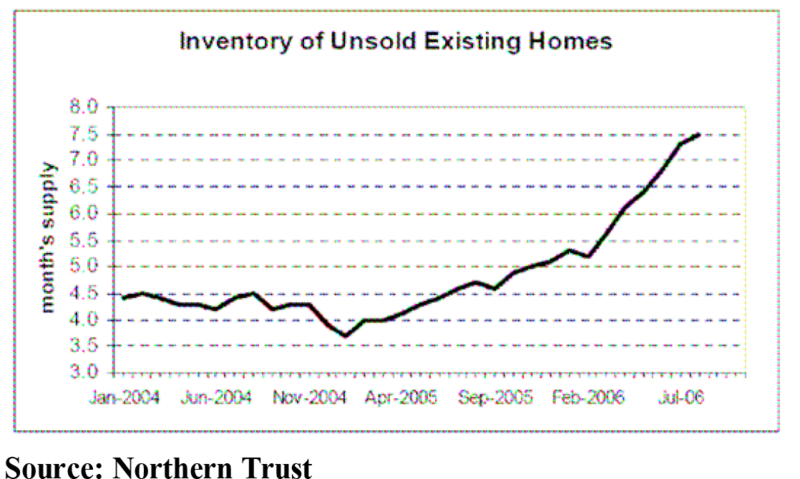 The result of this imbalance is a rising overhang of unsold homes as shown in Chart 4. The same trend shows up in the new homes market, Chart 5. How do we know that prices will come down as a result of the supply overhang? We know because prices have already started to come down. The latest data from the National Association of Realtors (NAR) and Census Bureau, Charts 6 and 7, through August (existing homes) and September (new homes) shows that the deceleration in home price increases has finally turned to an outright drop in prices, in the case of existing family homes, the first drop in more than a decade. The drop in new home sales prices is actually understated because move-in incentives increasingly being offered by homebuilders are not subtracted from the selling price. The recent drop in home prices is proof to us that the bubble has finally been pricked. 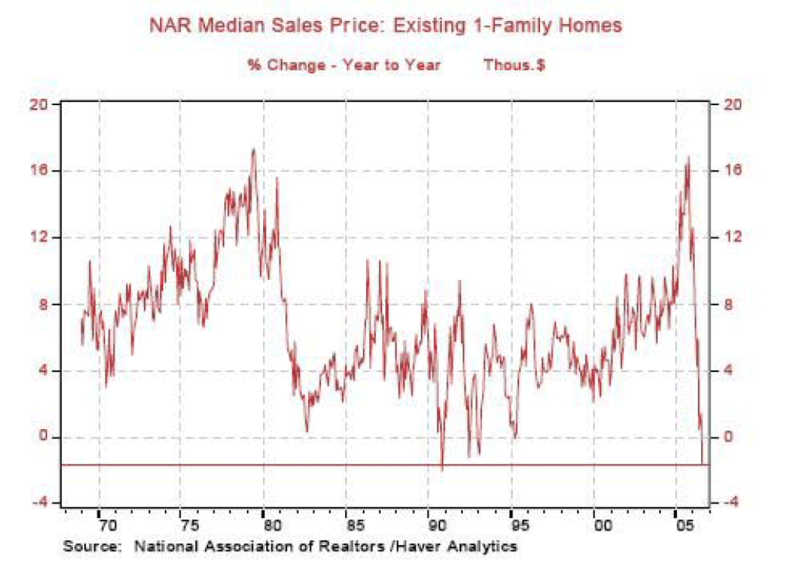 Given the extreme rising inventory- to-sales trends and the extreme run-up that we have had, it is clear to us that we are only in the very beginning stages of a major downturn in US housing. Prices therefore can and likely will drop much further. 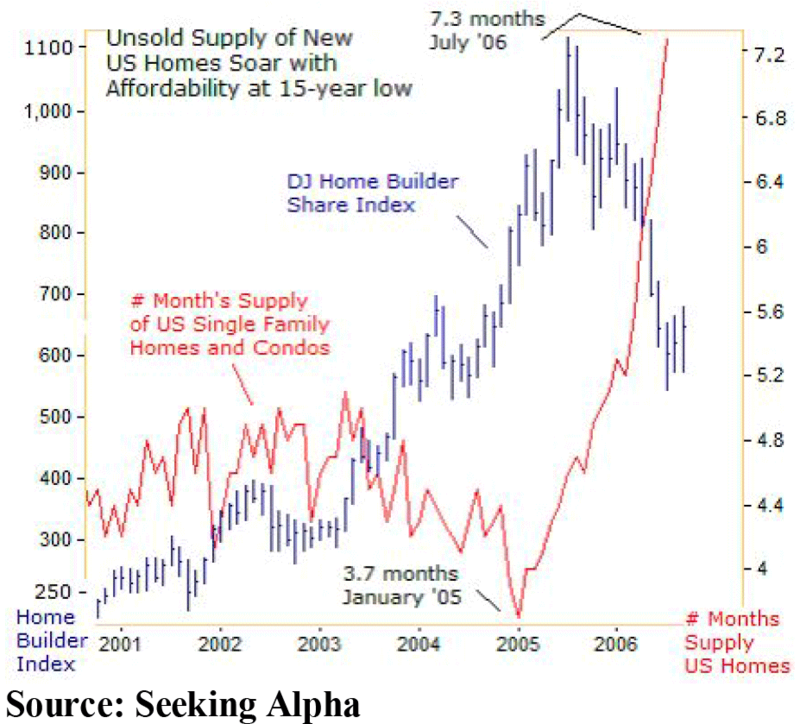 Housing stocks appear to have bottomed in late July and have been generally rising since then, as strangely many analysts and investors have been making bullish pronouncements on the group, as if the worst is over, and many shorts have been covering. Our housing and mortgage shorts have been a key driver of our returns year to date. While housing stocks have already had a good correction, we believe they still have substantially further to go down, and the recent bounce has created a good place for us to get short again. Analysts’ estimates for homebuilders are still far too optimistic in our opinion. As a result, price earnings (P/E) ratios appear to be low. Bulls on the homebuilders base their argument on these low P/Es, but we believe the P/Es will get higher and then turn negative as the homebuilders start taking write-downs of their assets including inventories, land, land options, and joint ventures. Homebuilders amassed substantial debt in the boom, much of it hidden off balance sheet through less- than-50%-owned joint ventures. Joint ventures and off-balance sheet debt were tools in the Enron fraud, but prosecution of Enron executives did not deter the homebuilders from continuing to use them. We will not be surprised to learn of earnings manipulation during the boom by the homebuilders through these vehicles. Homebuilders have also amassed land options as a way to get control of property without having to take on debt. If the housing bubble turns to bust, most of these options will become worthless. Most of the publicly-traded homebuilding stocks are currently suffering negative operating cash flows and many of them suffered negative cash flow throughout much of the boom. This negative cash flow in the industry has coincided with strong positive earnings being reported, again not unlike Enron, making past earnings and current book values in the industry highly suspect. We will not be surprised to see earnings being restated by many homebuilders as the industry downturn gains momentum. In our view it is only a matter of time before homebuilders start seeking tax refunds via asset write-offs and and/or earnings restatements to help pay off their debts and reverse their negative cash flow. The writing down of land options and joint ventures should prove to be the catalyst for the next major leg down in the housing stocks. The P/Es in housing stocks, which appear cheap at the moment, and often do near price peaks in a cyclical industry, will not look so attractive when earnings turn negative. 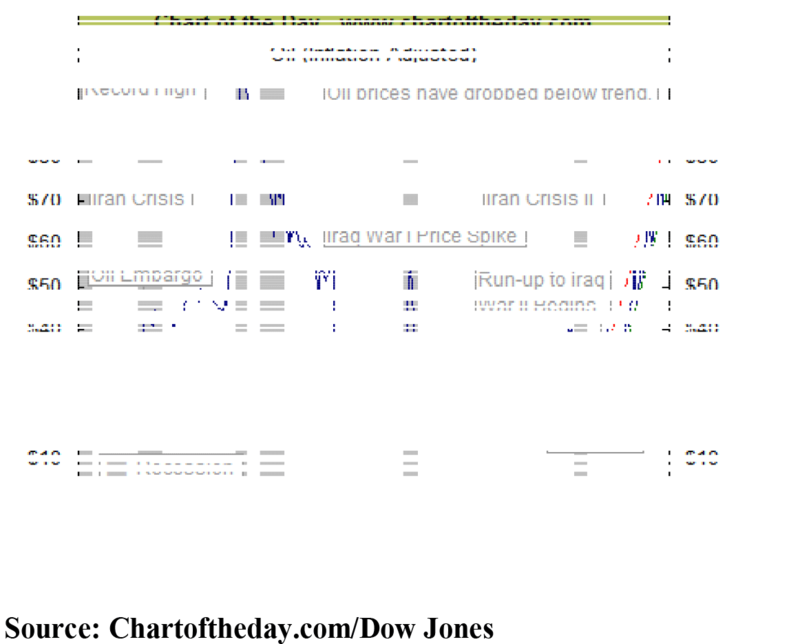 Price bottoms in cyclical industries typically occur after earnings turn negative, not before. Leveraged booms typically turn into leveraged busts, not soft landings, especially in a cyclical industry like homebuilding. We think it is critical to understand the role that housing has played in the economic expansion to understand the impact that its downturn will likely have on the economy. 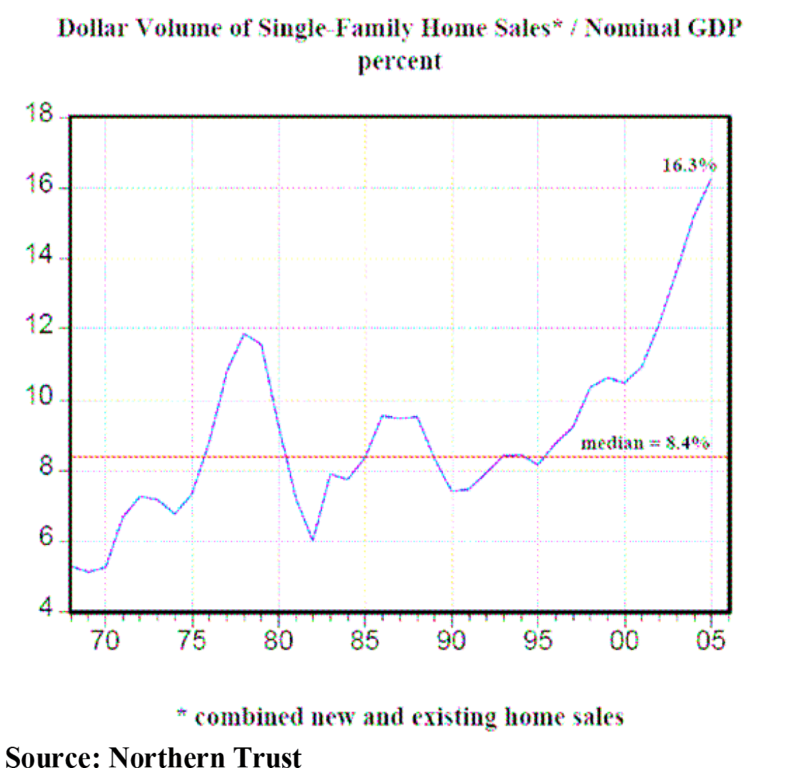 The dollar volume of single- family home sales relative to nominal GDP is shown in Chart 9. 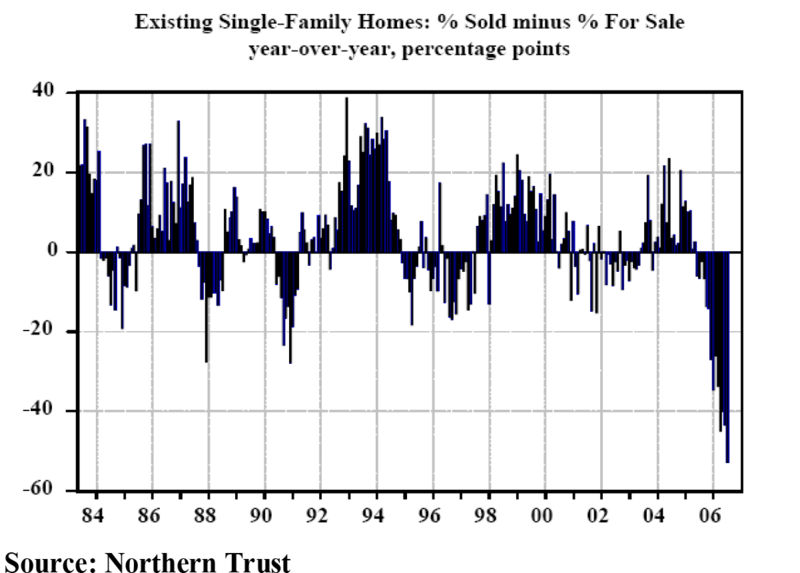 Last year the dollar volume of single-family home sales amounted to a record high 16.3% of nominal GDP. The previous record for a housing cycle was less than 12% reached in 1977. As Asha Bangalore from Northern Trust points out that this large dollar volume of home sales has had a powerful multiplier effect on the economy through employment creation in sectors like construction, real estate brokerage, mortgage brokerage, home appraisal, building materials production/sales, furniture/home furnishings/appliance production/supplies and materials transportation. The run-up in residential real estate values furthermore has enabled households to extract large dollar amounts of equity from their homes in order to fund purchases of consumer goods and services in excess of their after tax income. 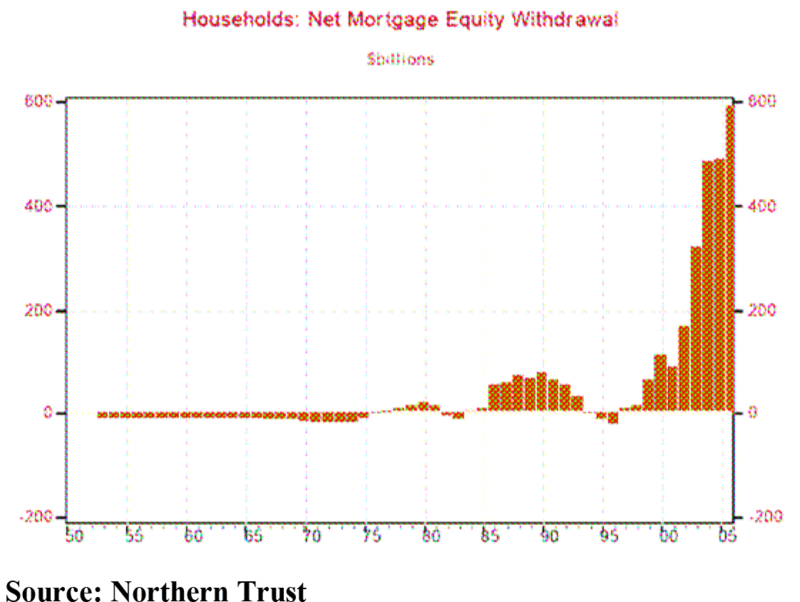 Chart 10 shows the amount of home equity mortgage withdrawals, a powerful stimulus to consumption. We expect home equity withdrawals to decline materially in the housing downturn negatively impacting US consumption, the largest component of our economy’s GDP. Further putting the economy at risk is the fact over the last few years for the first time in more than half a decade, the US personal savings rate has turned negative as shown in Chart 11. The negative savings rate has serious consequences for our future economic growth. 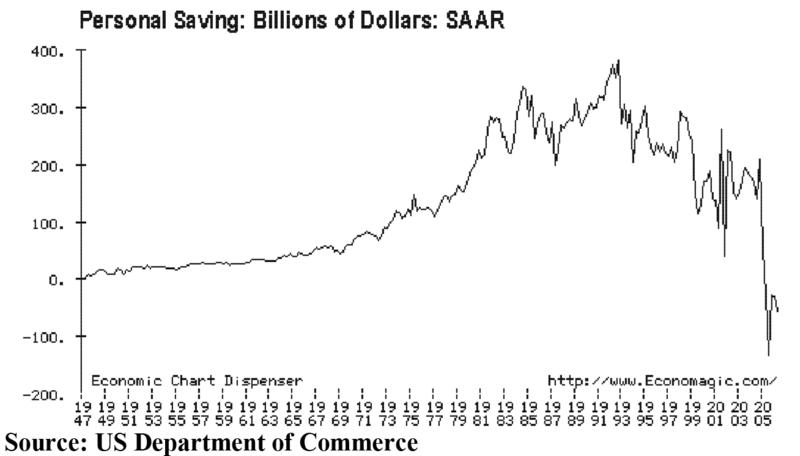 The cost to future GDP will become especially evident when savings rates increase again and consumption necessarily declines as a result. As a country, we have borrowed at an increasing rate from our future in order to consume more today. 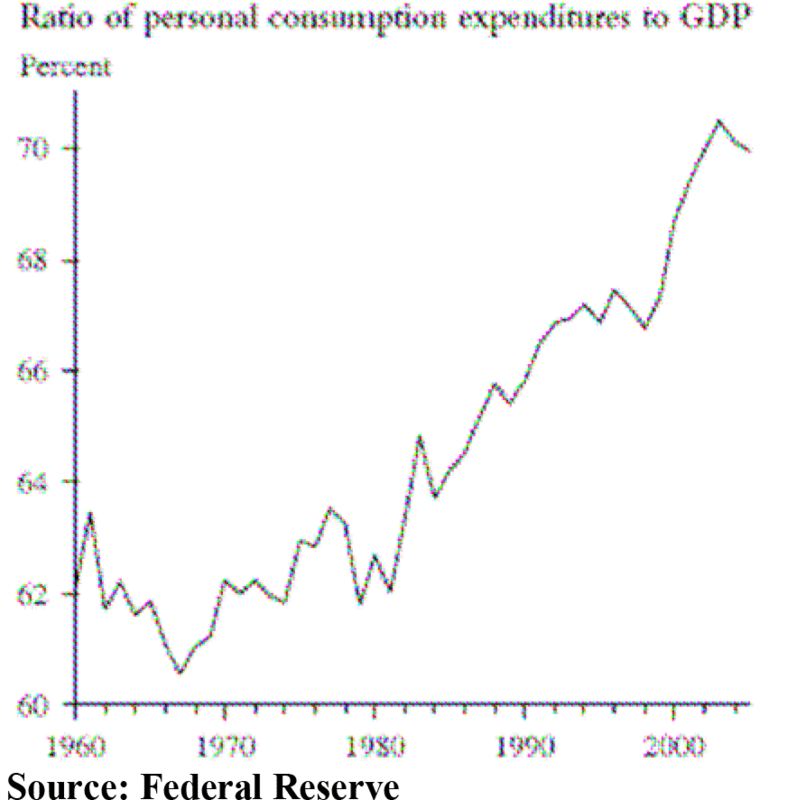 In Chart 12, we can see how consumption has grown over the years as a percentage of GDP. While increasing consumption has helped fuel recent and past GDP growth, the trend is unsustainable, since rising consumption in the last several years has been fueled by unsustainably rising real estate prices. The risk of recession comes primarily from the risk of an outright decline in consumption due to a decline in housing asset values. The stampede out of the housing market as registered by the increasing number of homes for sale is one in which there is no easy exit, since it has been taking an increasing amount of months (now seven) on average to sell a house, and actual unit sales of both new an existing homes have been declining for six months straight through August. Investors in US housing are stuck. The highly leveraged late-comers and the institutions that own their mortgages will be the ones getting particularly burned. Because homeowners can hardly get out of their homes, there will not be a lot of money coming out of housing to go somewhere else in the economy. The net worth of homeowners will simply drop if home prices continue declining as we expect. What was formerly a wealth stimulus effect to the economy from rising home prices that boosted consumption when these values were rising will have the opposite effect in a housing bust. Given how large a component of GDP that consumption has become, it is easy to see how materially declining consumption overall could lead to declining GDP and hence a recession. Many in the market seem to believe that the Fed has successfully engineered a soft landing. We think it is still too soon to reach that conclusion. 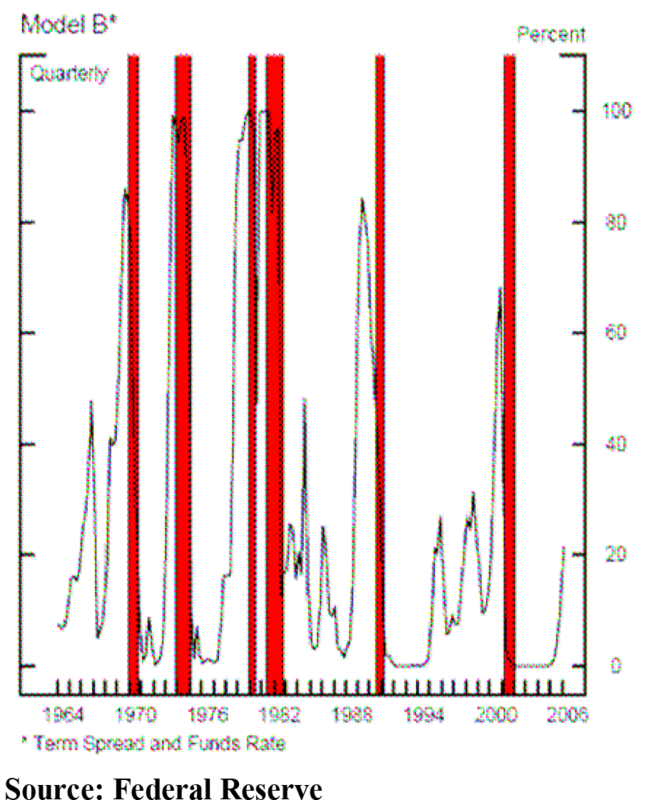 We showed in a prior letter that 8 out of 10 Fed tightening cycles led to a recession. On that basis, there is a 20% chance that the Fed engineered a soft landing and an 80% chance of a hard landing or recession. We are still sticking with those odds. Recessions have started anywhere from two to seventeen months after the last tightening. The last interest rate raise was at the end of June, four months ago, so we are still in the early part of the range. Since every single recession over the last 50 years has been preceded by a Fed tightening campaign, we still need to be cautious. Further reason for caution, as we showed in a prior letter, is that recent Fed tightening was the 2nd largest in history in terms of its potential destructive impact on asset prices given the non-linear (duration) impact of starting from a very low interest rate level. This impact is clearly starting to show up in declining home prices and we believe the Fed tightening was the catalyst. As we showed above, we think this decline in home prices has only just started. While the stock market, based on its recent run up, seems not at all concerned about a potential recession, it is very interesting to note that the bond market, which has a much better track record at predicting recession, has actually been giving an important warning. Flat and inverted Treasury yield curves traditionally have been very good at predicting recession. We have had a negatively-sloped yield curve that generally has been becoming more negative since the last Fed tightening. Johnathan Wright, an economist the Federal Reserve in Washington D.C., developed a model that he released in a paper entitled The Yield Curve and Predicting Recessions in February of 2006 that we show in Chart 13. The model that he found has the best power of predicting recession is one based on the difference between the yields on the three-month and ten-year Treasuries, combined with the level of the Federal Funds rate. What is interesting to note is that a recession has followed every time the probability of recession has exceeded 50% in this model. While the model only had a 21% chance of recession in February when he released it, when we plug the numbers into his model today, it has a 42% probability and recently was as high as 46%! There is a major disconnect because it seems most economists and certainly most investors in the stock market today are not taking this risk seriously. As a result there are imbalances that we believe we can capitalize on in the stock market. have only just started coming up from historically depressed levels, so we believe there is a lot of appreciation potential left in them. In the utility sector, demand is relatively predictable and stable because ratepayers still need to heat and air-condition their homes during an economic downturn. Utility rates in many states have been frozen since the Enron debacle, but during recent rate hearings, some states have granted significant rate increases, which is positive for earnings and margins and this is a trend that is likely to continue. The industry also appears to be in a more favorable regulatory environment for consolidation, which should be favorable for stock prices as well. One could also interpret recent strength in these sectors from a macro level as confirmation that an economic slowdown is in the works. We have been long these sectors in the fund and plan to maintain our exposure. The sector that jumps out as being the most over-extended when you look at Chart 14 is the financial sector. Financials have risen from 5% of the S&P 500 to 23% over the last thirty years. 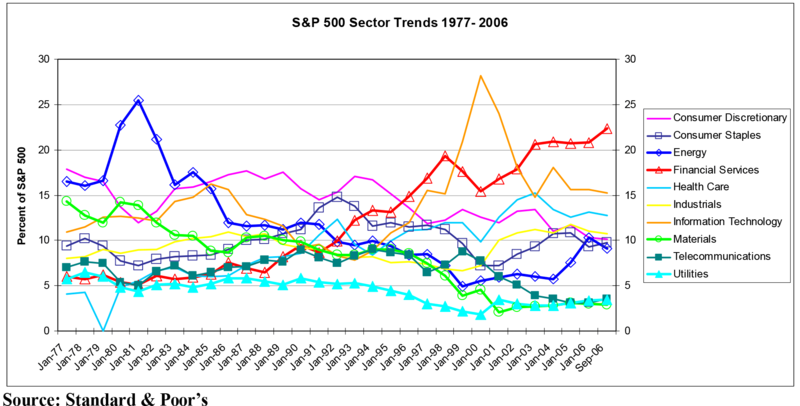 Notice how this sector percentage chart registered “bubble” peaks for the energy sector in 1981 when it reached 25% of the S&P 500 and the technology sector in 2000 when it reached 28%. If the housing bust continues to gain momentum, it will likely be the catalyst for a significant downturn in the credit cycle and hence the financial sector. It seems that very few Wall Street prognosticators are talking about a potential bubble in financials, but given their share of the market compared with other bona-fide sector bubbles, we believe this will be a very important sector to follow closely. We have been patiently waiting for signs of breakdowns in the many stocks in this group that have had phenomenal run-ups over the last several years in order to short them and we have found a few already. The problem is that many financials still score well in our model (and have for a long time-indicating the sector’s maturity) so we don’t doubt that there could be perhaps one more surge in the sector before it peaks. We are being very selective in the group in terms of our shorts at the moment. The housing bust logically should be the catalyst for a decline in the financial sector but this translation has yet to be made in the market. When the financial sector clearly starts to turn down, we plan to get much more aggressive with these shorts. Regarding energy, we are still very bullish on energy for the long term due to our peak-oil theme. It is interesting that many people think that we just recently had an energy bubble that has burst. As the sector chart shows, the energy bubble was in 1981 when energy stocks reached 25% of the S&P 500. The surge in energy in 2006 took the sector up to only 11% at the most, hardly a bubble compared to energy’s history. The run up in oil in the 1970s was due to peak oil being realized here in the US during that time. As we are now dealing with the increasingly likelihood of peak oil on a global level, we believe that the energy sector has only just started another major secular move up. Short-term, we believe the energy sector has been undergoing a normal cyclical correction. We believe many, including the Fed, have begun to take falling energy prices for granted. This may prove a costly mistake. If peak oil truly is happening sooner than the country at large believes, we could get another oil price spike very soon, even in a otherwise slowing economy. We think very few investors at the moment see this coming, but it is a very real possibility. A particularly nasty recession could develop if we were to have skyrocketing oil prices and plunging housing at the same time. These are risks that we plan to both hedge against and capitalize on should they come to fruition. Just as people think the energy markets have peaked, many think we have already had a bubble in commodities that is bursting. We are still secular bulls on commodities but believe the economic slowdown will continue to pose short-term cyclical risk to the commodity sector. In the stock market, the commodities sector is known as the materials sector. Look how depressed the materials sector (which includes the gold stocks) has become over the long-term view in the S&P 500 sector chart. We think materials stocks have substantial appreciation potential over time going forward and will especially become popular again once we get on the other side of the economic slowdown or recession. Naturally, demand for energy and other commodities can and will likely fall in an economic slowdown. We view the recent correction in energy and materials stocks in part as a forecast for a weaker economy hence weaker demand. What has been interesting to see over the last few months however is that money coming out of energy and commodities has indiscriminately been going into almost all other sectors of the stock market. For instance, cyclical sectors like industrials, consumer discretionary, and technology have been doing very well over the past few months at the same time that defensive sectors have been doing well. Earnings are still coming in strong for companies in the cyclical sectors so it is understandable that many investors would still be interested in them. It is very important to understand that earnings are strong at cyclical peaks by definition. We think investors are getting sucked into cyclical stocks very late in the game and very likely at a peak. The problem is that the earnings of cyclical companies will deteriorate rapidly in an economic decline. That is why they are called cyclicals. We think the cyclical stocks have just given a major head fake, and we are increasingly looking to take advantage of more shorts in these sectors as a result. Such shorts will likely do well as we get further signs that the economy at large is slipping due to the bursting of the housing bubble and the weakening consumer. While the energy markets have experienced a sharp correction, the likelihood that the world is facing peak supplies of crude oil soon to be on the decline has not gone away. Energy markets however have been roiled over the past few months after an exodus of speculative money from the sector which coincided with the collapse of a large hedge fund, Amaranth. Energy commodities historically have always been highly volatile. We view the recent correction as a normal cyclical correction in a secular bull market. The correction in energy has been steep and is the primary cause of the fund’s poor performance in August and September. Peak oil remains one of our major secular themes and the worst of the recent correction we believe is likely behind us. The inflation adjusted prior peak for oil is just under $100 per barrel (see Chart 15) according to a study by Dow Jones. With peak world production likely happening much sooner than the market expects, we believe real oil prices will go much higher in this cycle. World oil production actually looks like it already has been peaking (see Chart 16) although there was a spike in August based on preliminary production figures from the Energy Information Administration (EIA) that in part has been responsible for the recent fall in oil prices. Kenneth Deffeyes, Princeton geologist, and author of Beyond Oil, predicted based on analysis of production trends that world oil production peaked at the end of 2005. Other peak-oil forecasters largely agree with his views. The data for the first eight months of 2006 were generally confirming this prediction until August. Even if you factor in the August production spike, an argument can still be made that world oil production is peaking now or has already peaked, but we will need to see production continue to level off in the months ahead. By many forecasters’ predictions, if it is not already behind us, it is coming soon. The August production spike may just have been an aberration and may even be revised downward since it is preliminary number. 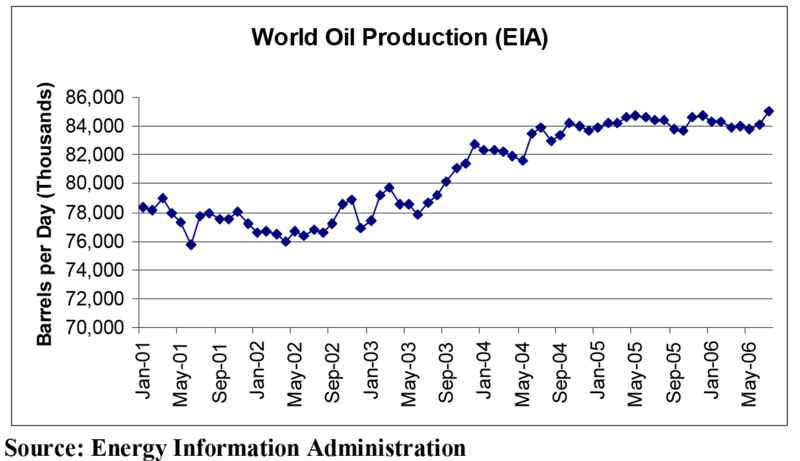 We will be following the production numbers closely as they are the key to whether or not we are reaching peak oil now. Most of the world still does not subscribe to a near-term peak oil theory. The view promulgated by the US Geological Survey (USGS) is still the dominant worldview on peak oil. This view believes that our oil supplies are limited and will eventually peak but not until near the middle of the century. It is important to understand that the USGS forecast is based on the work of the major US oil companies who sponsored and approved it. It is not unbiased, independent government research but rather comes from industry. We believe that the industry has a strong bias to overstate supplies in order to discourage competition particularly in the form of alternatives. The industry wants to maintain its hegemony in the energy markets and our dependence on oil. The flaw we believe in the USGS forecast is that it is not based on actual production trends but rather on hope in new technologies to recover more oil from existing reserves. Actual production trends point to a peak much sooner. soon be forced to revise its production forecasts downward and peak time- table sooner in order to match up with actual production. Recent production trends have been extremely flat while demand continues to increase. The supply/demand imbalance has been the reason for generally rising oil prices over the past few years. We believe this imbalance will continue. We find it very interesting that the EIA, while subscribing to the USGS data for its long-term forecasts, seems to be confronting reality by basing its near-term forecast on actual production data. The EIA is predicting that world demand for oil in the fourth quarter of 2006 will be 87 million barrels per day but supply will only be 85 million barrels per day. If the EIA’s near-term forecast is accurate, oil will likely have a big spike this quarter. This is a major imbalance. The biggest risk to the EIA forecast in our view is a drop in demand due to an economic slowdown, however, not an increase in supply. 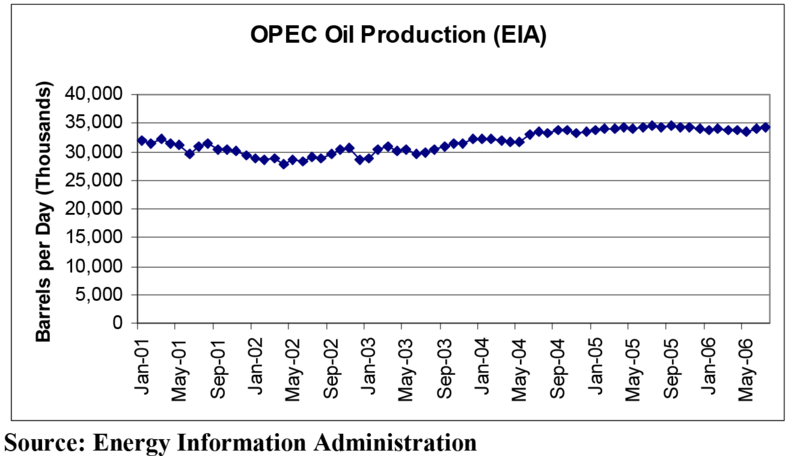 The USGS predicts that long term growth in oil production will largely come from the OPEC countries. This is a major disconnect because we can clearly see that OPEC production (Chart 17) has been very flat already for the past few years, and even declined in much of late 2005 and early 2006, while worldwide demand has been very strong. The idea that OPEC just announced production cuts may well be a way to justify without admitting that the downward slope of world peak oil is already under way. The tendency of big oil companies to overstate their production capabilities is nothing new. M. King Hubbert, the famous geophysicist who accurately predicted peak oil in the US while working at Shell Labs in the 1950s was ostracized by industry executives for his views. Because the world largely ignored Hubbert’s views, the energy crisis of the 1970s was much worse than it needed to be. Meanwhile, big oil cleaned up due to sharply rising prices. Only after peak oil became a reality in the US was Hubbert recognized as a great scientist in his industry. It is very logical that big oil’s response today is the same as it was in the 1970s. We are now facing the strong probability of Hubbert’s peak on a worldwide basis. We think big oil is well aware of this and is eagerly looking forward to profiteering from the supply/demand imbalance. As a consequence, there is a very real risk is that the world economy will suffer another major energy crisis. Based on the current production trends, such a crisis may take the world by surprise sooner rather than latter. Very credible peak-oil scientists, using the Hubbert’s production modeling methods, are warning that peak oil may already be upon us. Such scientists have been stressing the need to invest in viable energy alternatives to replace oil, and have been warning that because of under-investment in such alternatives, due to deceptive, cornucopian forecasts by the oil majors, we are still decades away from having, viable, cost-effective energy to replace depleting oil. We aim to both capitalize on and hedge against the risks created by this imbalance. Based on the recent stock market surge, it would seem like a recession is the farthest possible thing from reality. With oil prices coming down and corporate earnings still coming in strong, the stock market has been on fire. We think the market at large has gotten a boost primarily from declining energy prices which are temporary. Money has been pouring out of the energy and commodity sectors back into stocks at large. The rally also has been fueled by short covering from hedge funds that were short for good fundamental reasons but were too early. We think there is little fuel left for a continued broad market rally. We believe that discrimination among sectors in the stock market will become increasingly important and opportunities abound on both the long and short side as a result of current imbalances. We believe the bursting of the housing bubble will in fact translate into a downturn in the economy, while the stock market has falsely been projecting a soft landing. Many people think the worst of the housing correction is over, but we believe that the negative momentum in home prices and the housing and related industries will continue for many months. The downturn in housing is already significant enough that we may very well find ourselves in a recession in the current quarter. This is typical of recessions which often aren’t recognized until after the fact. We believe the sectors of the market that will do well going forward will be the defensive sectors, particularly consumer staples and utilities. Other than energy, we think most other sectors of the market are vulnerable to a correction based on their cyclical nature in a hard landing for the economy. Particularly, we think the recent run-up in consumer cyclical stocks is unwarranted. We think the consumer has finally run out of gas. 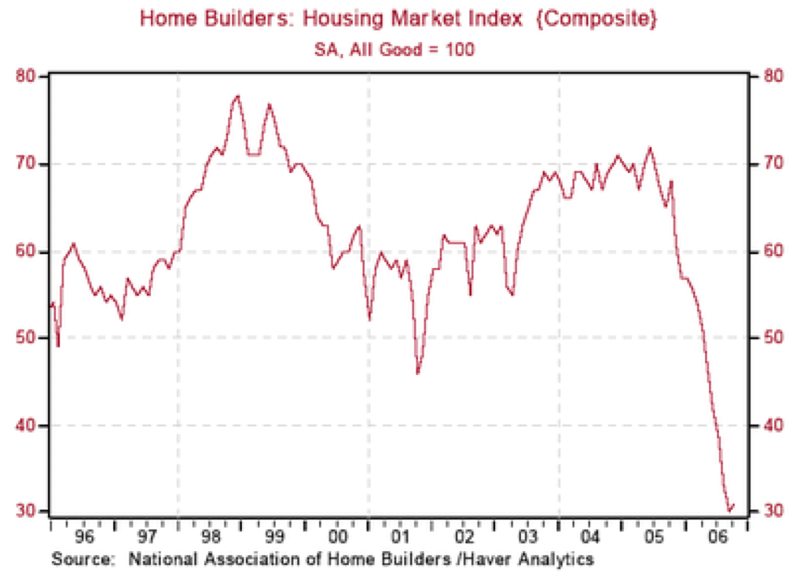 We believe there is further downside in the homebuilding stocks. We are watching the financial sector as we are concerned with the housing burst’s implications for a downturn in the credit cycle. Financials represent the most over-extended sector in the market based on our long-term analysis of sector trends and likely presents a great sector for selective shorts. The one cyclical sector of the market that we still like is energy, and we like it a lot. Investors have become remarkably complacent about recently falling oil prices. Even the Fed in its recent statement indicated that it is taking falling energy prices for granted. We think the potential for further-rising oil prices is one of the most important risks in the economy. We believe that peak oil is being realized on a global level sooner than expected and perhaps even now. We think the major oil companies are striving and succeeding at keeping the world in the dark on important peak-oil issues, and energy prices have significantly further to rise as a result. Thank you for investing with us. We look forward to providing further updates on our efforts to exploit the imbalances in the macro economy. The information contained herein is being sent to limited partners, clients, and other people who have been pre-qualified and have requested such information. The information is not being distributed publicly, is confidential, and is not to be redistributed to any other persons without the express prior permission of the general partner. Quantitative modeling, in and of itself, may not be sufficient to determine which securities to buy or sell, or when to buy or sell them. The general partner applies its own discretion in making investment decisions based upon the data provided by quantitative modeling. There can be no assurance that the use of quantitative modeling will enable the general partner to make investment decisions that will result in the fund achieving its investment objectives. Past performance does not guarantee similar future results. Opinions expressed in this letter are subject to change. The foregoing is not an offer to buy or sell securities. An offering of interests in the partnership can only be made by the private offering memorandum.